There's nothing extra special about this burger, per se, it's the topping ON the burger that's so special. If you are fan of All-Things-Spicy, like me, then you'll love this. 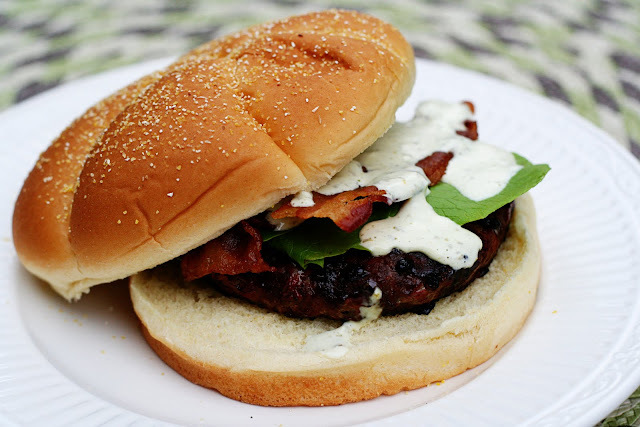 It's the perfect condiment for a well-grilled, juicy burger with bacon. It's a quick and easy recipe that can be made in advance and kept in the refrigerator until you're ready to use it. It's also great on turkey sandwiches, as my hubby will attest to! On a side note, I bought the world's biggest hamburger buns this week. My burger patties were a good 1/3 lb each if that gives you an idea of just how big these buns were. I got so tired of eating my yummy burgers with the standard, tiny buns that I went a little overboard in the bread aisle. In a blender or food processor blend all ingredients until smooth. Store in the refrigerator. Yum! That sounds delicious! Is it better if made in advance? Do you know how long it will stay good for? I've made this a couple of times now and can't tell a difference in the flavor whether it's made in advance or not. I've kept it in the refrigerator for about a week before the cilantro starts to break down.